Picked-On Poindexter – a heartwarming story with a positive message about being different and the challenges of getting picked on. 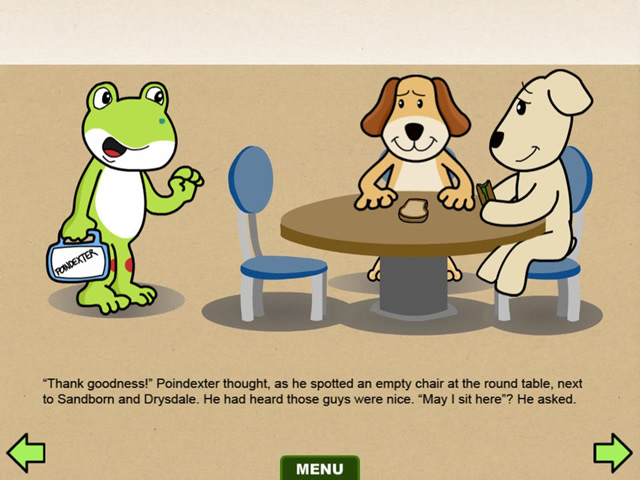 Poindexter, a lovable frog, was picked on for being different. Follow him through his first day of school and his encounter with the lunchroom bully, Bonky. Poindexter confronts the challenges of being different and makes an unexpected friend in the process. *Huggable 13″ stuffed Poindexter the frog is available on our website! 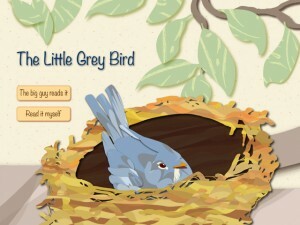 * First in a series of interactive books with music to help children cope with the challenges of normal growth and development. *Coming soon- Sniffly Sandborn visits the doctor! *If you like our app we would appreciate you taking the time to rate it and write a review. 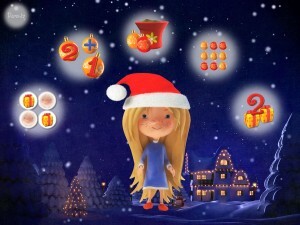 Kwik let me focus on the artwork and animations without needing to worry about code optimization. Everything that we wanted to see in the book was made 100 times easier thanks to Kwik. Everything that Kwik has to offer is amazing. 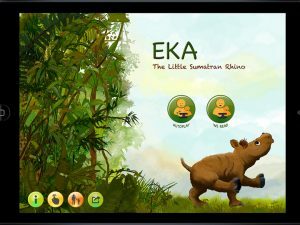 All of the features in the Kwik panel are huge time-savers when it comes to creating book apps. I can’t imagine creating book apps without using Kwik. Think about the devices you’d like to support first. In this case, we knew that a device like the first generation Kindle Fire would be the lowest common denominator. It would have the smallest resolution and the lowest hardware specs, so we made sure everything ran smoothly on that device. If it ran well on a Kindle Fire, we knew it would be fine on iPads. 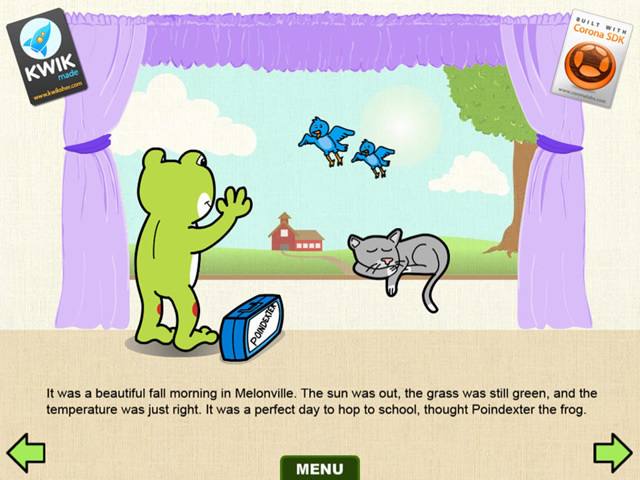 Picked-On Poindexter is the first musical storybook created by Huggable Melodies, being illustrated and developed by old time friend Greg Pugh. 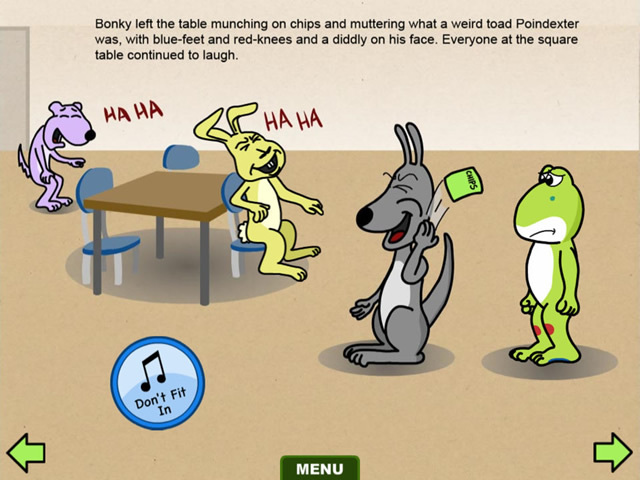 The story is educative, bringing important topics as differences, bully and acceptance. 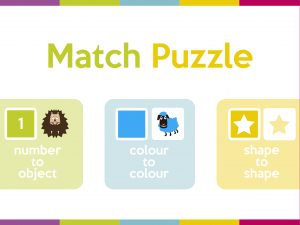 The characters are cute and the five original songs are really the must of the app. I missed only background audios in some scenes and the option to see words highlighting when read. Maybe in the next update. Overall, a beautiful app with a great message behind.